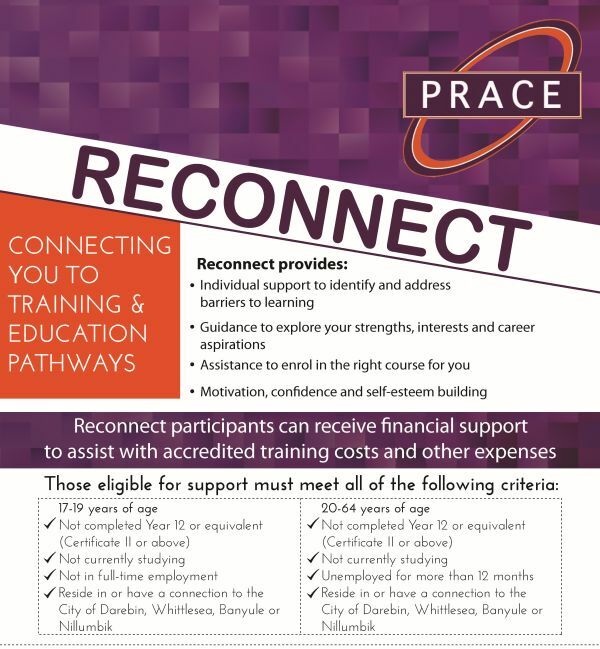 Funded by the Department of Education, Reconnect provides individual support to plan a return to education, assisting program participants to obtain the skills needed to pursue meaningful employment in future, in their chosen career. Reconnect Case Workers conduct a holistic assessment of individual circumstances, discuss goals and aspirations, provide career advice and guidance, as well as assist with all aspects of enrolment into accredited training. Amanda*, aged 22, was referred to Reconnect by her local Council youth service. She had been unemployed for two years, and had not undertaken any training since leaving school in Year 11. Amanda struggled with anxiety and depression for twelve months, but felt that returning to education would be a move in the right direction for her. In exploring her goals, Amanda discussed an interest in hospitality and tourism, and hoped to find employment in a bar or restaurant. Her Reconnect Case Worker explored options around this, with Amanda deciding to undertake a Certificate II in Skills for Work and Vocational Pathways, which included specialist barista training, Responsible Service of Alcohol certificate and a work experience component at a local café. Through this time, Amanda continued to meet regularly with her Case Worker, who also linked her in with a housing service when her living arrangements became unstable. Amanda applied for work at a café soon after her course ended, and was successful in gaining casual employment. In the months since exiting Reconnect, Amanda went on to obtain employment in a hotel, where she continues to work whilst also undertaking further training around business management.